The Mind's Eye - Jon Lieff, M.D. Oliver Sacks is the master neurological storyteller who has written many wonderful books. This latest book is perhaps the most personal and poignant. He has always written about the amazing changes that the plasticity of the brain can bring about, but none so brilliantly as in this book, which focuses on difficulties with vision. His gift is to take impossible terms like prosopagnosia, alexia and agnosia and bring them to life with detailed stories. It is equivalent to understanding and experiencing the lives of animals that have entirely different sensory systems. A musician who can no longer read music but can perform from increased memory ability demonstrates extraordinary plasticity. Other examples include individuals who overcome the limitations of blindness utilizing increased tactile sense, increased visual imagery, and the rebounding of auditory clicks. 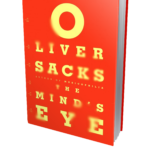 One psychologist, blinded at age 21, had such increased memory that he was able to replace the gutters of his house.But, the most important part of this book is Dr. Sacks’ description of his own illness. His longtime inability to recognize faces was greatly complicated by a visual tumor that created other symptoms including inability to see on his left side. Always the brilliant clinician he gives uniquely clear descriptions of his own very serious clinical states.This is one of the great books on neuroplasticity.